Selling shares... sometimes I get something right! Once in a while, if only by dumb luck, or random chance, I get things right. This page is a slight departure from most of the pages at this site exploring the joys of personal investing in the stock market. Whereas most of the site is about a hypothetical portfolio, the sales I am about to discuss were real sales made on July 3rd, 2012 from my actual portfolio. As of July 4th, 2012, it looked like "I did good"... or at least had a bit of good luck. There are many, many articles available to you about how to buy shares. Good selling is every bit as important, and a little more complicated. As long as you have some cash, you can buy any one of hundreds of companies. On the other hand, (until you move into short-selling and options!) you can only sell shares which you have previously purchased. Buying shares is mostly about "what is being offered at a good price?" and "what do I already have in my portfolio?". When you come to sell shares, other things, such as the capital gains tax you will pay, come into the picture. Have a look at the following three month charts. On the July 3rd, 2012, in no small part due to efficient service from the person who deals with such things for me at the brokerage I use, I was able to do some selling. In each case the red line is at the level of the price I was paid for my shares. Easy enough to see why I was happy with the XOM and STR sales, I think? The DOW not so obvious, perhaps... but if I tell you that for it I fear that dips downward are more likely than a return to the glory days up around $34 and higher, maybe you'll understand that I'm happy for the "bounce" from $30.50 to $31.50, even if I would be happier still if I'd been "wise" enough to sell in April at $36. Have you noticed that the vertical scales are nothing like the same? Always consider scales. Would you have said, at a glance, that the DOW had been... by one measure... twice as volatile as the other two? I think that people who forgot to look at the scales might have missed that. They might have said the stocks were swinging about the same amount... at least in terms of how far they were swinging. 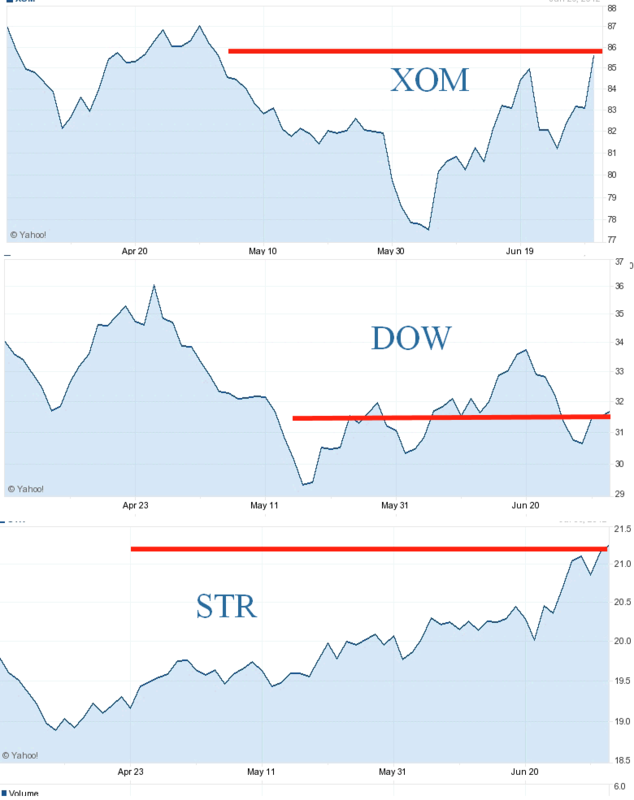 Of course, the way the XOM and the DOW were swinging was quite different from the way the STR was moving... during the three months shown. .... Yes! $75 per share. "Up 50%" followed by "down 50%" doesn't take you back to where you started! Not if you use the terms as people usually do. As I say, at the time, I am pret ty happy with having made the sales when I did. There are many clouds on the financial horizon. Yes, many "storms" have swept over us in the past months, but I fear a general collapse may occur at any moment... in which case, I am going to be very happy to have the cash instead of the shares. Assume I sold 100 shares of each company. The XOM is the big winner... so far... of course. Had I sold less than a month ago, I would have obtained nearly $600 less for my shares. Of course, I didn't get quite so "lucky" with the DOW... but I judge that we are more likely to return to 30 or so rather than go back to the 35 at which I might have sold. And of course, the rise in the XOM and STR prices (in particular) might continue. I may be gnashing my teeth, thinking "Why did I sell last month, when the prices of these stocks were so low?" But here's the thing... the longer something's been rising, the more I wonder if it is going to continue to rise. Of course, we get times when almost all stock prices are rising. (And times when almost all prices are falling!) Part of the trick is seeing how prices are changing in relation to general patterns. And specific patterns, e.g. when thinking "Was it a good idea to sell the oil stock (XOM)?" you need to be looking at how other oil stocks are performing at the moment, and how you expect them to perform going forward. Why sell anything ever? Well... I needed some cash! And sometimes you sell company "X" because you feel that if your money were invested in company "Y" it would give you a better total return. I haven't told you part of the story. I have been working towards making these sales for a few weeks now. Wasn't I lucky that the day I was finally ready to actually make the sales was "a good day" for the stocks, especially the XOM? Ah, the fun the stock market can be! If you are selling company "X" to re-deploy the capital as an investment in company "Y", is "Y" actually a better investment? And how much will it cost you to switch the investment? If you are selling because you need cash, is this the moment to do it? If you "need" the cash now, do you have some excuse for not seeing that coming? Did you choose to sell at a good time, or were you forced to sell regardless of the market's current state? How much capital gains tax will you have to pay when you sell your existing holdings? I sold my XOM at around 85, my DOW at around 31 and my STR at around 21. If I bought them at 85, 31 and 21 respectively, I won't have capital gains tax to pay. Of course, I'll be disappointed that the price didn't rise more while I owned the stocks, but maybe the dividends will have been reason enough. At the moment, my broker pays me 0.03% interest on money I loan him. (I.e. the cash in my account.) The dividends on the three companies are 2.7%, 4.1% and 3.1% respectively. Of course, the value of cash in my account doesn't go down, whereas the value of the stocks can go down. But, to return to the question of capital gains, perhaps the XOM is worth three times what I paid for it, and the DOW and STR worth only twice what I paid for them. In isolation, from the standpoint of the capital gains tax I have to pay, it would be best to sell the DOW and the STR, but, if I can get enough cash by selling the other two, not the XOM. We'll look at two final issues: The sector a stock is in, and P/E ratios. Suppose you had stocks in a coal company. And you, and only you, knew that the government was going to ban the burning of coal in power stations from next year. You'd sell your coal company stock pretty quickly, wouldn't you? Of course, we rarely have such insider knowledge, and things are rarely so simple, but as the economy of our country and our world evolves, certain sectors and types of stocks have "good times".... and others have "bad times". If you are clever/ lucky enough that you only ever buy stocks of companies that are the best in their sectors, you still have to ask "which sectors have improving prospects?" "Which are entering hard times?" And industry sector is not the only way you can categorize stocks. You can buy shares in big or small companies. You can buy shares in companies which pay big dividends or not. Each sector, and each type of company, other things being equal (which they never are) has its good times and its bad times. And lastly for this essay, but not in the total answer to "was that a good time to sell", we come to P/E ratios. As I said before, other things will not be equal, but if they were, you want to buy shares at times when the P/E ratio is low. The stocks are "a bargain"... unless a drop in earnings is about to occur. But even that is too simple. A P/E of, say, 7.5 isn't automatically "good". If company "X", at the moment, has a P/E of 10, but has usually, over the years had a P/E of 6, then it may be overpriced. On the other hand, company "Y", also with a P/E of 10, may be a bargain... if over the years it's usual P/E has been, say, 15. And whenever a company's P/E is other than "normal", you have to ask yourself... "Is there a reason?" For instance, is the brilliant CEO getting rather old, about to retire, and there's no obvious new person of equal acumen standing by to take over? You might see the P/E falling and think you're looking at a bargain... if you don't look further. Trailing P/Es for the three companies I sold: 8.3 (XOM), 17.0 (DOW), 17.9 (STR). As of July 4th, 2012, I feel pleased with the sales I made yesterday. Were they good sales? Ask me in a year's time... I'll know then.